Rare on-stage document from simpler times when entertainment allowed itself to be carelessly topical and dangerously catchy. As the genre’s title suggests, pub-rock bands’ natural habitat was not in the studio but in front of the audience; the more surprising, then, should be the deficit of concert recordings from that era, which is why this fabulously sounding relic – preserved for posterity in June 1974 at “The Top Rank” in Cardiff and previously available only as a download – is more than welcome. 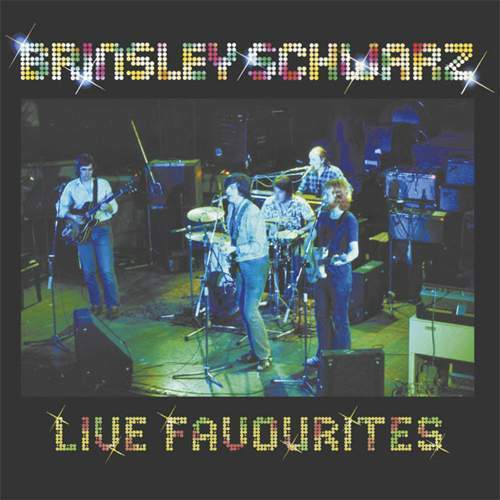 Capturing BRINSLEY SCHWARZ in top form, the tapes are full of surprises, repertoire-wise, although the quintet pulled no punches when it came to interspersing familiar material with songs played for their own, and the punters’, pleasure, so the effervescent reserve of “Happy Doing What We’re Doing” on “Live Favourites” is an epitome of the ensemble’s approach. With three numbers apiece from “Nervous On The Road” and “The New Favourites Of…” – the group’s most recent release – and a few cuts from other albums, the Brits also stray onto an untrodden terrain to intersperse excitement with intrigue, and they’re really doing it right. The band keep the listener’s perspective fresh with things like the delicate “Private Number” – it would be laid down for the combo’s next offering, the ill-fated "It's All Over Now" – and, although there’s no escaping the elegant exuberance of “Country Girl” or “Ju Ju Man” that bookend this show, it’s the tight “Honky Tonk” that’s arguably the most pub-perfect performance on display. Where “Small Town, Big City” is trying to appear too polite in presenting the mix of guitar twang and organ swirl, the rougher instrumental drive and rawer vocal harmonies of “Trying To Live My Life Without You” is bound to stir up the mood and whip up the crowd for “(What’s So Funny ‘Bout) Peace, Love And Understanding” which sparkles incredibly bright in live environment. If “You’re So Fine” and “Hip City” outline the ensemble’s panache, with Brinsley blaring incendiary sax, Ian Gomm peeling off infectious licks, and Nick Lowe’s bass puncturing the jive – “Surrender To The Rhythm” seems to be the greatest ultimatum an artist can give their fans, and it’s impossible not to surrender to such a brilliant set. A genuine gem.